Promoting Wellness, Preserving Our Planet! Nothing says “I love you” or “I value your friendship” like something homemade and delicious! Why not whip up a batch of these luscious cookies and brighten someone’s day?! Valentine’s Day is approaching, and we have the perfect token of affection for the food lovers in your life! From now until February 14th, Crowded Earth Kitchen is pleased to offer our Bookworm Bundle for only $19.99 – that’s a savings of over 30%! One copy of The Global Recipe Project cookbook, featuring delicious recipes and photographs from around the world! One author-signed copy of How to Bake a Chocolate Soufflé, Carly Ellen Kramer’s highly reviewed food fiction novel! One high gloss European Bakery notecard (with envelope) for writing your affections to your Valentine! Simply click on the PayPal link below to place your order. Bookworm Bundles will ship within 24 hours of purchase. Here’s a new spin on an old favorite, a truffle that tastes like a peanut butter cup! 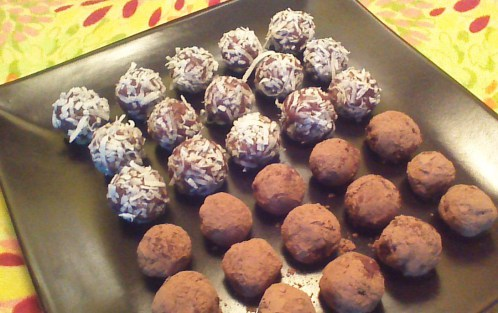 While some truffle recipes are a bit fussy, these Chocolate Peanut Butter Truffles are super easy. You can use either creamy or chunky peanut butter, depending upon the texture you prefer. You could even substitute the peanut butter for something a little fancier, like almond butter or crème de marron. Be creative and have fun! This chocolate fondue requires only three ingredients – what could be easier? While a fondue pot works wonderfully, it isn’t essential. A double boiler or even a small saucepan can work just as well (use a low heat, to avoid scorching). Try chocolate fondue for your next party, movie night, or stay-at-home date! Step 1) Combine chocolate and half-and-half in a fondue pot (or top of a double boiler). Melt over low heat, stirring constantly. Step 2) Just before serving, stir in Irish cream liqueur. Enjoy! A month ago, I had ambitious plans for Valentine’s Day treats – plans that involved hours of baking and decorating. Somewhere over the course of a month, real life snuck in, and I just flat ran out of time. So, I improvised. 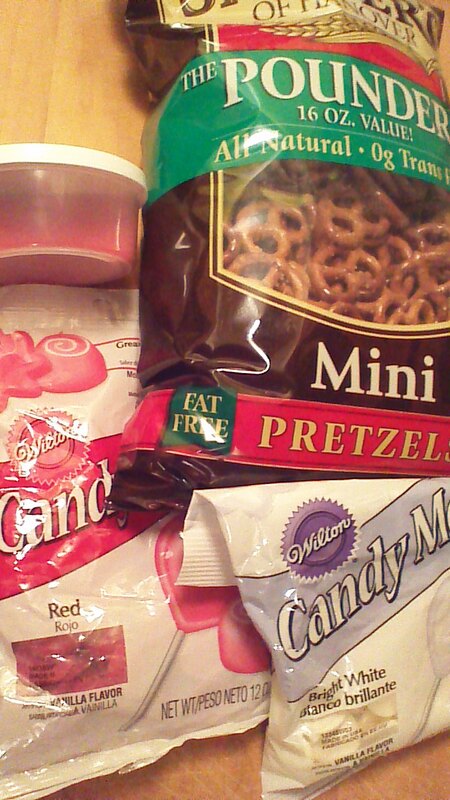 Valentine Snack Mix is fast and festive! If you stop at the market tonight for just a few ingredients, you’ll be able whip up a treat in no time! Have fun! 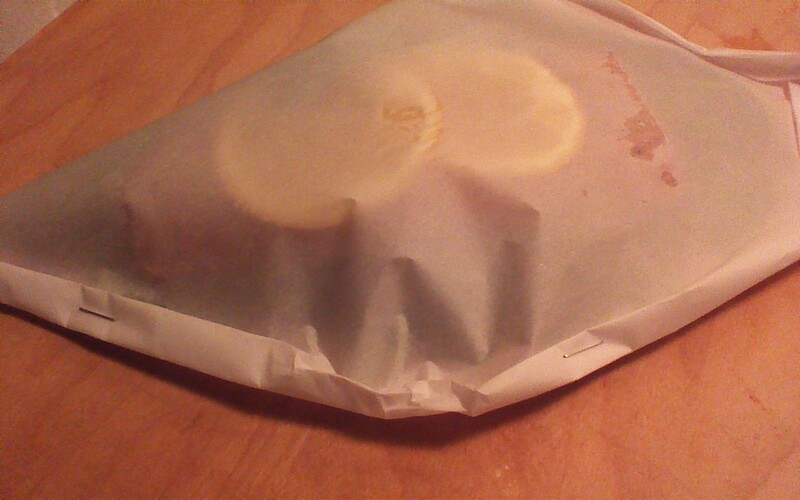 Step 1) Melt the candy melts or white baking chips in the microwave. Stir every 30 seconds until fully melted. 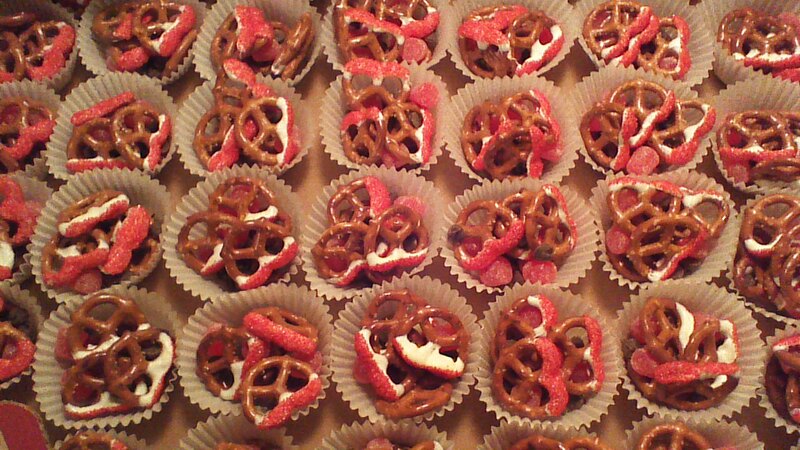 Step 2) Dip tops of pretzels in melted white chocolate. 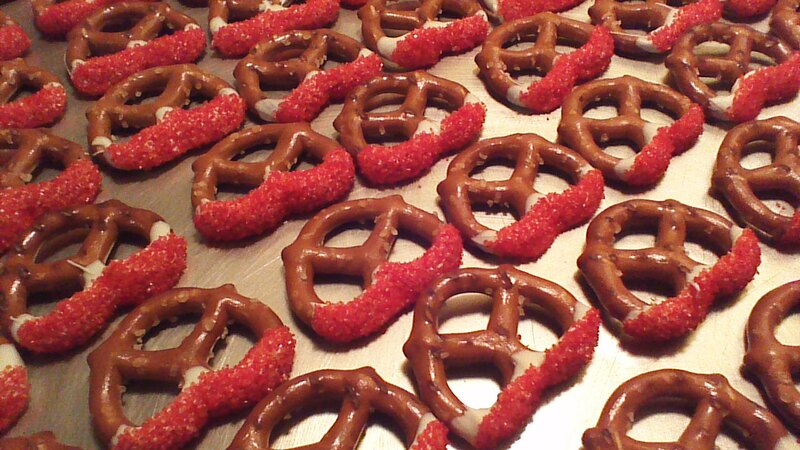 Then, dip into red sugar crystals. Allow to harden on baking sheets. Step 3) Mix together pretzels, chocolate chips, and gumdrops. Serve in a large bowl, or in individual muffin liners. Shown served with Whole Wheat Molasses Bread and a glass of Sauvignon Blanc! In the spirit of Valentine’s Day, there is a lot to love about this meal. First, wild salmon is a heart healthy delicacy with which Crowded Earth Kitchen recommends indulging as often as your budget allows. Baked on a bed of fresh baby spinach, dressed with a bit of citrus, and served with a delicious whole wheat bread (see 2/11/14 post), this meal is a nutritional superstar. 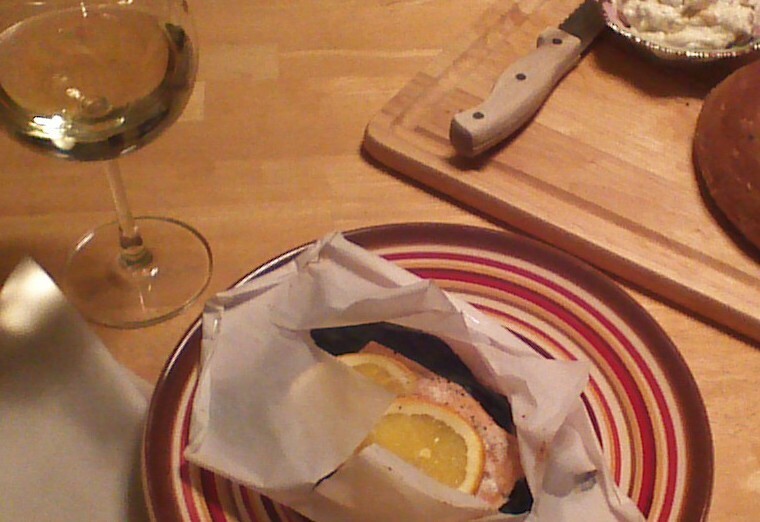 Second, baking with parchment is the perfect combination of “really easy but looks complicated,” which makes it a perfect technique for impressing your guests without inducing a pre-dinner, kitchen meltdown. You need exactly five items to prepare this fabulous entrée. That’s right, five. It’s that easy. Have fun, and let me know how your dinner turns out! 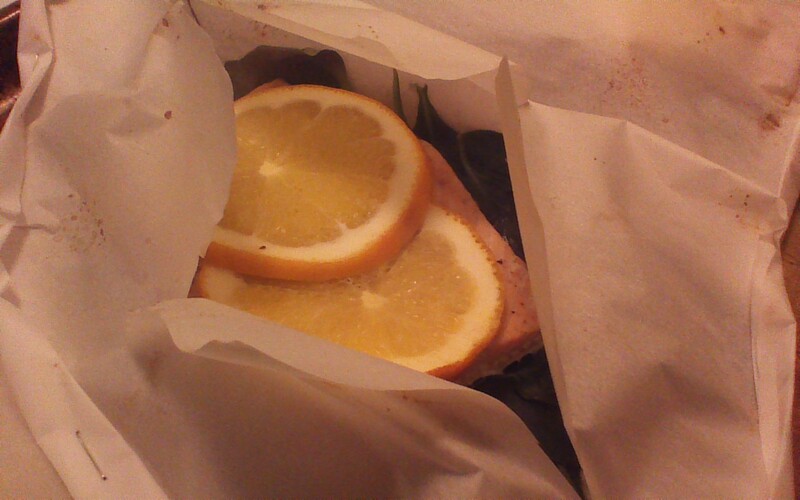 Step 1) Tear two rectangles from your roll of parchment paper, approximately 14 inches long. 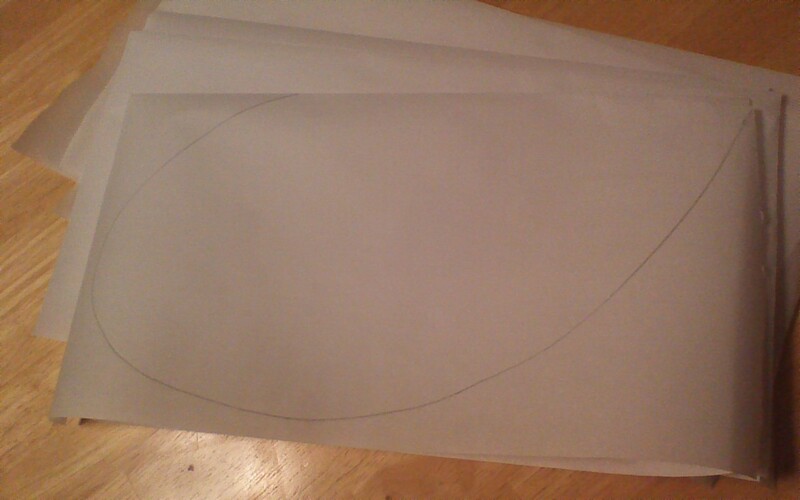 Fold them in half, and trace a half heart shape on the paper, as shown. Cut out your parchment hearts. If you’ve never worked with parchment before, it’s sold right next to plastic wrap and aluminum foil. Step 2) Open your parchment hearts and anchor them onto your work surface, so they don’t curl up (annoying!) as you are layering your ingredients. I find that salt and pepper shakers are just the right size for this. 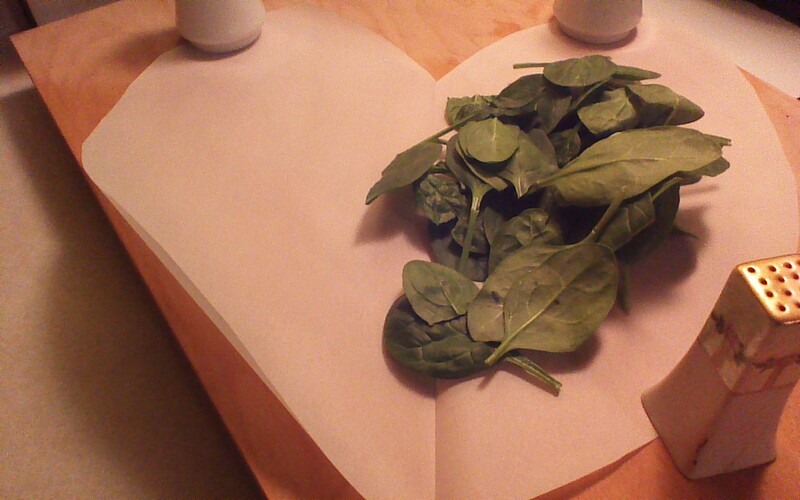 Step 3) Place two cups of fresh baby spinach on one half of each parchment heart. It’s OK if the spinach overlaps the center of the heart a bit, but leave 2 inches of empty space around the edge. You’ll need that space later! 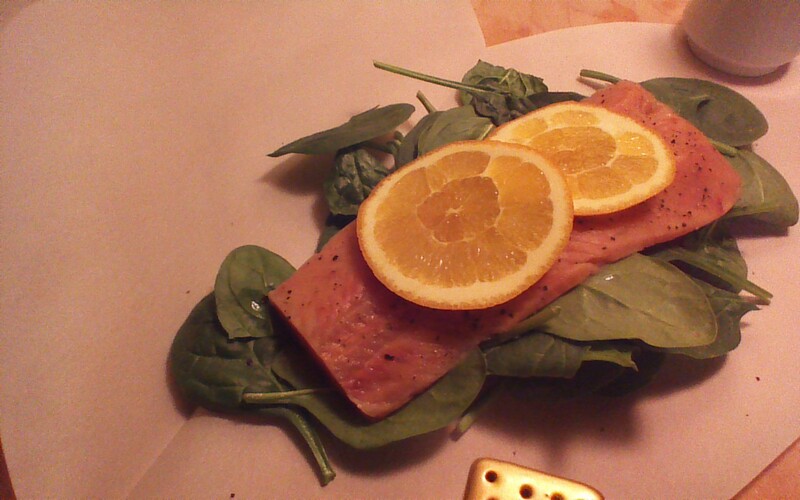 Step 4) Place a Wild Salmon fillet over the center of each spinach bed. Sprinkle with coarse ground pepper, and top with two slices of orange. Now comes the fun part! Step 5) Fold your empty heart half over the “stuffed” half, and begin sealing the edges by folding them tightly two or three times. If you’d like, you may staple the fold, but count the staples (hint: use the same number for each serving) and either remove or warn your dinner partner before serving! Step 6) Place filled parchment hearts on a baking sheet and bake in a preheated, 400 degree oven for 20 minutes. 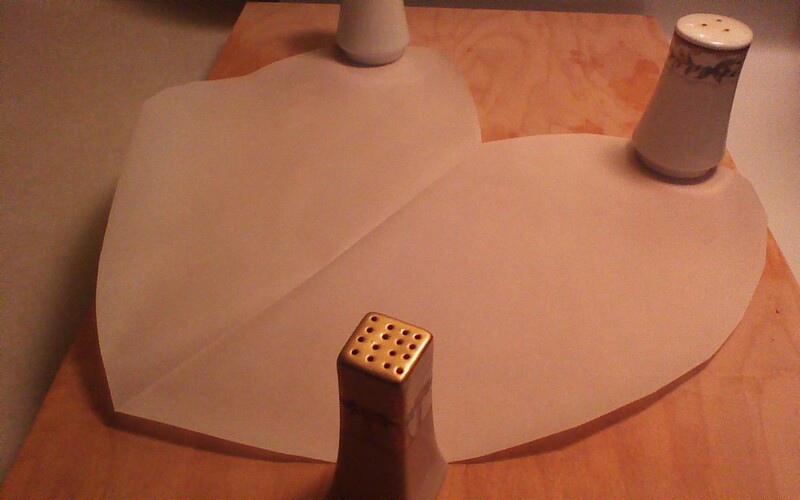 After baking, carefully cut an X shape in the top of each parchment to allow steam to escape. The steam will curl the edges back, making a lovely presentation! Follow Crowded Earth Kitchen via Email! Enter your email address to follow Crowded Earth Kitchen! When a new post is available, you'll be among the first to know! Like Crowded Earth Kitchen on Facebook! Follow Crowded Earth Kitchen on Twitter!